Left/Right is an introspective comedy that follows D. Ray Morton, a small-town have-not who has grown up to be a conspicuous, big-city socialite. But after a human resource audit reveals an overstated educational background, Ray loses his job, his gaudy paycheck, and in turn, his identity. In an attempt to salvage his career and self-worth, Ray returns home to feebly check the boxes on this embellished resume. While there, Ray comes to find out that his obituary, not his resume, will be the true measure of his worth. Left/Right is an introspective comedy that follows D. Ray Morton, a small-town have-not who has grown up to be a conspicuous, big-city socialite. But after a human resource audit reveals an overstated educational background, Ray loses his job, his gaudy paycheck, and in turn, his identity. In an attempt to salvage his career and self-worth, Ray returns home to feebly check the boxes on this embellished resume. While there, Ray comes to find out that his obituary, not his resume, will be the true measure of his worth. 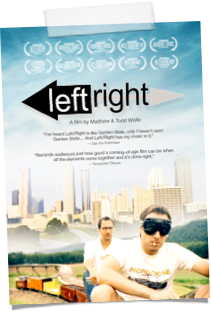 Welcome to the official website for the movie Left/Right. This independent feature was filmed in Atlanta, GA & Danville, PA and is the the first feature by brothers Matthew Wolfe & Todd H. Wolfe.